(Nanowerk News) To gain even deeper insights into the smallest of worlds, the thresholds of microscopy must be expanded further. Scientists at the Helmholtz-Zentrum Dresden-Rossendorf (HZDR) and the TU Dresden, in cooperation with the Freie Universität Berlin, have succeeded in combining two established measurement techniques for the first time: near-field optical microscopy and ultra-fast spectroscopy. Computer-assisted technology developed especially for this purpose combines the advantages of both methods and suppresses unwanted noise. This makes highly precise filming of dynamic processes at the nanometer scale possible. The results were recently published in the research journal Scientific Reports ("Optical nanoscopy of transient states in condensed matter"). Many important but complex processes in the natural and life sciences, like, for example, photosynthesis or high-temperature superconductivity, have yet to be understood. On the one hand, this is because such processes take place on a scale of a millionth of a millimeter (nanometer) and therefore cannot be observed by conventional optical microscopic imaging. On the other hand, researchers must be able to observe precisely very rapid changes in individual stages to better understand the highly complex dynamics. The development of high-resolution temporal and spatial technologies has therefore been promoted for decades. The new camera from Dresden combines the advantages of two worlds: microscopy and ultra-fast spectroscopy. It enables unaltered optical measurements of extremely small, dynamic changes in biological, chemical or physical processes. The instrument is compact in size and can be used for spectroscopic studies in a large area of the electromagnetic spectrum. Time increments from a few quadrillionths of a second (femtoseconds) up to the second range can be selected for individual images. “This makes our nanoscope suitable for viewing ultra-fast physical processes as well as for biological process, which are often very slow,” says the HZDR’s Dr. Michael Gensch. The nanoscope is based on the further development of near-field microscopy, in which laser light is irradiated on an ultra-thin metal point. This creates highly bundled light – a hundred times smaller than the wavelength of light, which otherwise represents the limit of "normal” optics with lenses and mirrors. This technology, known as SNOM (Scanning Near-Field Optical Microscopy), is typically only utilized for imaging static conditions. Using ultra-fast spectroscopy is the crucial tool, on the other hand, enabling scientists to study dynamic processes on short timescales and with extreme sensitivity. The spatial resolution has, until now, been limited to the micrometer range however. The principle in such pump-probe experiments that function, for example, with light, pressure or electric field pulses is as follows: while a first pulse excites the sample under study, a second pulse monitors the change in the sample. If the time between them is varied, snapshots can be taken at different times, and a movie can be assembled. A clever correction of the measurement errors leads to the high sensitivity of the spectroscopic procedure. Activation by an excitation pulse means a type of disturbance for the entire sample system, which needs to be filtered out so that noise or the “background” is eliminated. This is achieved by probing the unperturbed sample with a second reference pulse directly before the excitation. This particular technology could not be combined with near-field optical microscopy until now. For the first time, the teams led by the two Dresden physicists have managed to combine all the advantages of both methods in their nanoscope. 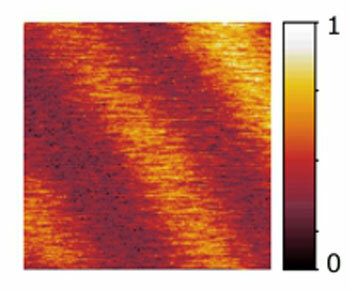 “We have developed software with a special demodulation technology with which—in addition to the outstanding resolution of near-field optical microscopy that is at least three orders of magnitude better than the resolution of common ultra-fast spectroscopy—we can now also measure dynamic changes in the sample with high sensitivity,” explains Kehr. The clever electronic method enables the nanoscope to exclusively record only the changes actually occurring in the sample's properties due to the excitation. Although other research groups have only recently reported good temporal resolution with their nanoscopes, they could not, however, obtain this important correction mode. An additional advantage to the Dresden solution is that it can easily be integrated into existing near-field microscopes. Universal in every respect “With our nanoscope’s considerable wavelength coverage, dynamic processes can be studied with the best suited wavelengths for the specific process under study. This is an important step in understanding these processes. Our colleagues at the Freie Universität Berlin have, for example, the ambitious dream of tracking structural changes during the photocycle of an individual membrane protein at specific wavelengthes in the infrared spectrum,” Gensch says. Together with his TU colleague, Susanne Kehr, he demonstrated the new method on a known sample system, a semi-conducting layer made of silicon and germanium. “Had we used an unknown sample for the demonstration, we would not have been in the position to correctly interpret the functionality of our approach,” Kehr stresses. The Dresden nanoscope is universally adaptable to respective scientific questions. The probe pulse wavelengths can, in principle, reach from the low terahertz range to the ultraviolet range. The sample can be stimulated with laser, pressure, electric field or magnetic field pulses. The principle was tested at the HZDR on a typical laboratory laser as well as on the free-electron laser FELBE. First tests on the new terahertz source TELBE, which provides extremely short electric and magnetic field pulses for excitation, are in preparation. “In the future, we will not only see how quickly a process occurs, but we can also better localize where exactly it takes place in the sample. This is especially important for our TELBE facility, which will be in operation next year,” explains Michael Gensch, head of the TELBE project at the HZDR.